2017 Panini National Treasures Football brings all the super-premium elements collectors expect for $495 per box. It’s not just autographs, but a much higher percentage of them are marquee autographs. It’s not just basic jerseys, but lots more patches and prime swatches. Print runs for individual cards are low. You get the idea. The brand has been a staple for more than a decade now and 2017 doesn’t see it change direction. 2017 Panini National Treasures Football has six hits per box–three autographs and three memorabilia cards. Base cards in 2017 Panini National Treasures take a few forms. For starters, there’s the shell set. Including parallels, these land two per box. All are numbered to 99 or less. But the part of the main set that garners the most attention is the Rookie Patch Autographs (RPA). Traditionally, these ranked as the most coveted Rookie Cards of the year. Numbered to 99, all have the trademark prime jumbo swatch to go with the signature. Among the RPA parallels are brand and team logos, jersey numbers and one-of-one NFL Shields. 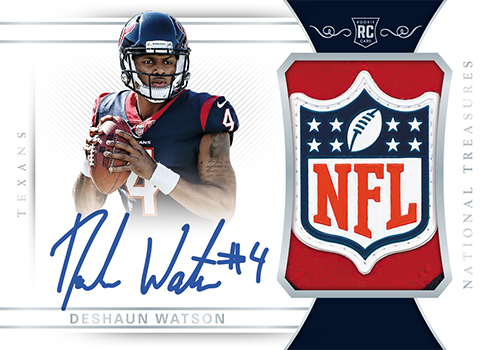 Not every autograph in 2017 Panini National Treasures Football is going to be a Hall of Famer or all-time great. But few products bring together as many legends, past and present. Signed inserts cover a lot of ground, some familiar, some new. NFL Greatest Signatures is one that has been used before, but not for a handful of years. This is a set that only has big names and only has on-card signatures. All have 25 copies. The Future brings something new to the product. Also coming with 25 copies each, these autograph cards use acetate in their construction. Synced Signatures is another insert that uses acetate. These have a pair of signatures done on-card and have no more than 25 copies each. Colossal Signatures and Material Treasures Signatures both return, combining autographs and swatches. 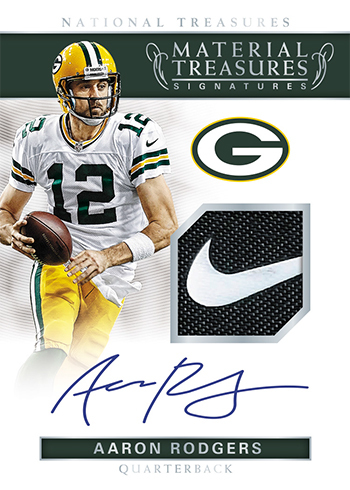 Material Treasures Signatures signers include Aaron Rodgers, Joe Montana, Peyton Manning and Dak Prescott, all hard-signed. Colossal Signatures has a generational mix of talent and include things like tags, logos and shields in some of the swatches. Treasured Signatures and Treasure Chest Signatures are large book cards with eight and 12 autographs. One such card planned for the set has a dozen signatures from Super Bowl-winning Hall of Famers. Rookie Jumbo Prime Signatures booklets might not have multiple signers but they do combine an autograph with a premium jumbo swatch from a member of the 2017 draft class. These are numbered to 99 or less. 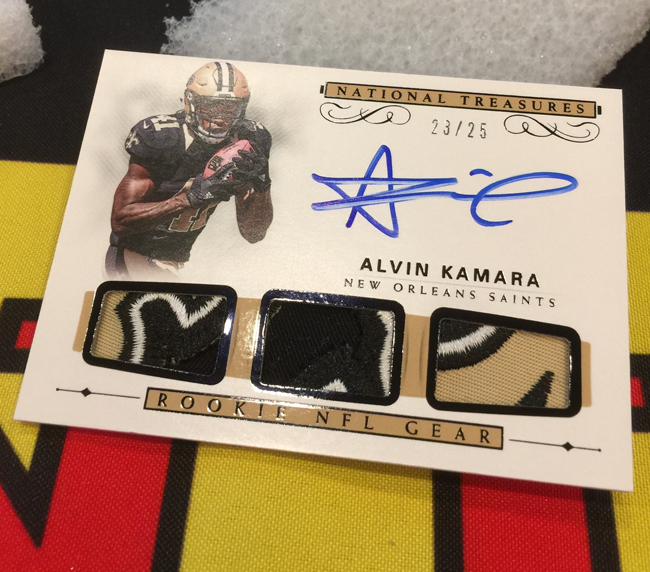 2017 Panini National Treasures Football finds a variety of ways to showcase gear worn by players. Some are jerseys. Others have things like Captain’s patches, team logos, jersey numbers and laundry. 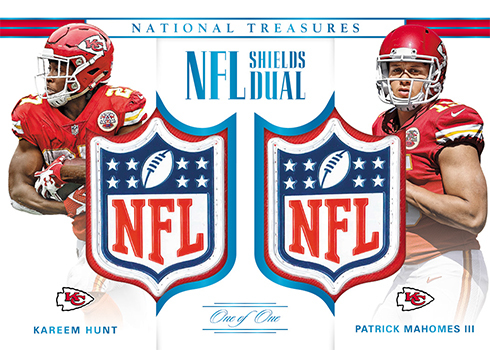 A select few collectors will find one-of-one cards with a pair of NFL Shields.